One of the most important parts of national development is having a strong workforce with solid skills and inspiring attitude towards work. 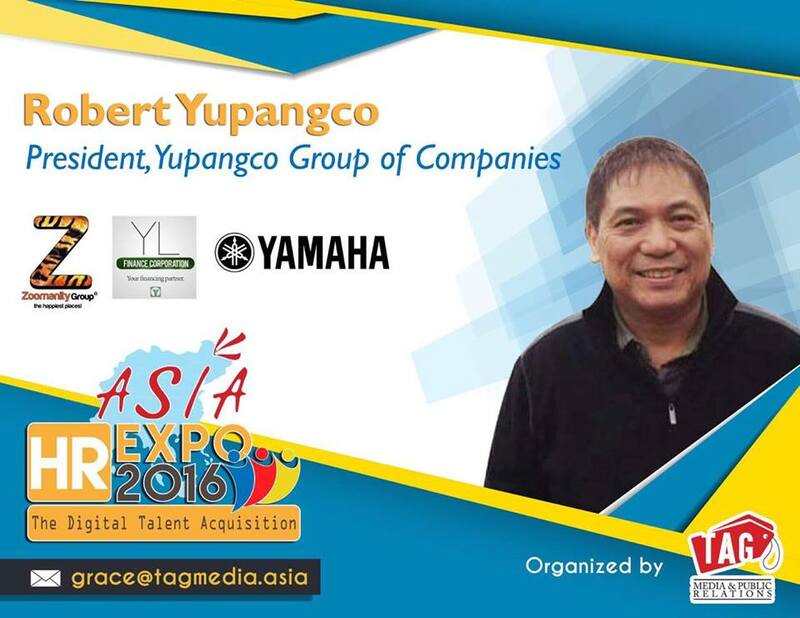 Today, I'm happy to share with you an amazing news about Asia HR Expo 2016 and Robert Laurel Yupangco. When it comes to handling and recruiting people, Mr. Robert Laurel Yupangco of Yupangco Group of Companies is the expert with manpower distribution to his 6 theme parks, 4 restaurants, more than 100 branches of Yamaha Music School, Finance company and more. On September 16, 2016 at SMX Convention Center, Taguig from 8:30AM to 6PM, the first conference to discuss the "Digital Talent Acquisition" will be here under Asia HR Expo 2016 brought to us by TAG Media and Public Relations with the objective to promote the Philippines as the premier business hub in ASEAN region and beyond. Mr. Robert Yupangco will be in a panel discussion and round table discussion along with leaders such as the country head of monster.com, Assistant Vice President for Recruitment of Teledevelopment, Vice President of Concepcion Carriers, Country Head of Bestjobs and many more. Theme Parks under Yupangco Group is under Zoomanity Group which is composed of Zoobic Safari in Subic, Zambales, Zoocobia Fun Zoo in Clark, Pampanga, Residence Inn in Tagaytay City, Cavite, Paradizoo in Mendez, Cavite, Zoocolate Thrills in Loboc, Bohol, Nanten Japanese Restaurant inside Manila Polo Club, Makati, Misono Japanese Restaurant in Bel Air, Makati and more.